my bare cupboard: Braided cream cheese and ham / Nutella / tomato and ricotta pesto rolls ( light wheat bread with Tangzhong ) "
There is no such thing as too much food photos . The post title alone is a mouthful . That's what you get if you can't make up your mind . But that's a good thing , who wants just one flavor when you can have three ?! Okay , I'm partial to the cream cheese and ham , no surprise there ! Hey , both Nutella and pesto were really good . A spin off of the light wheat toast recipe from the Bread Doctor book , instead of making a loaf bread , I've made something small and with filling . I love filled bread , sweet and savoury alike , but when it comes to making bread , I lean towards savoury . Nutella though is another matter and I can't resist it ! This is a very easy recipe , the whole wheat flour makes the dough easier to handle . After the initial stickiness , kneading the dough was so easy . The waiting is the hardest part , 'twas 13°C the morning I've made it , it takes about 2 hours for the first rise and another 2 hours for the final proving . The only thing that I want to change when I make this recipe again is too add more cream cheese and ham . 60 grams of cheese is not just enough ! 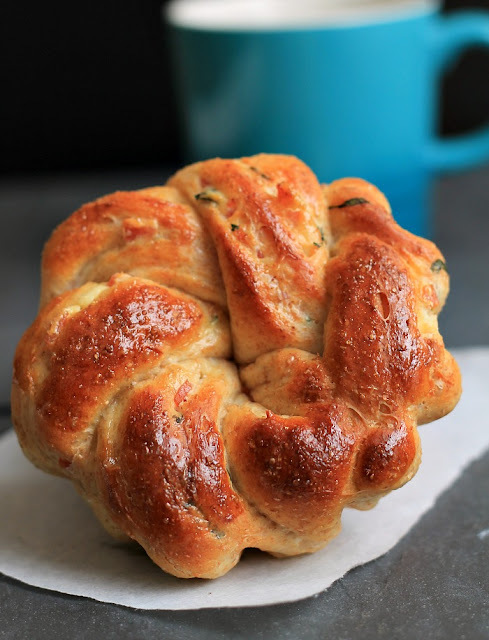 Do you like sweet or savoury bread ? Cream cheese and ham filling : 60 grams cream cheese ( at room temperature ) , 30 grams cooked ham ( cut into a small dice ) and 1 1/2 tablespoons snipped cilantro leaves ; combine ingredients and set aside . * In a large mixing bowl , combine the two flours , sugar , salt and yeast , use a whisk to mix everything together . Make a well in the center and pour in the whisked egg , milk , water , Tangzhong and melted butter . Using a wooden spoon or a sturdy spatula or your hand , mix until it forms a shaggy dough . * Tip in dough onto the work surface and knead until dough is soft and elastic , about 13 minutes . Form dough into a ball and transfer to a lightly-oiled mixing bowl , turn dough once then cover tightly with a plastic wrap . Let dough rise into a warm place until doubled in size . * Divide dough into ( 4 pieces , 220 grams each , if making 2 loaf bread ) 12 ( my final dough is 940 grams ) equal pieces and form into a small balls , let rest , lightly-covered , for 15 minutes . * Roll each dough into 8 1/2 or 9-inches long and about 4 1/2-inches wide , spread the filling , and roll filled dough into log . About 1/2-inch from the top of the log , make a cut all the way through then braid together , keeping the cut side up and connect both ends together . Put rolls into a lightly-oiled 4-inch baking tins or a 4-inch baking paper cups . Cover and repeat with the rest . * Let rolls rise until doubled in size . * Meanwhile , preheat oven at 180°C . Glaze rolls with egg wash and bake for 20-23 minutes or until golden brown . Serve warm or at room temperature . This post is linked to the bloghop event Little Thumbs up , organized by Zoe of Bake for Happy Kids and Doreen of My Little Favourite DIY . This month's theme is CHEESE and is hosted by Alice of I Love. I Cook . I Bake . These varieties flavour braided bread looks so inviting. So beautifully and perfect made. 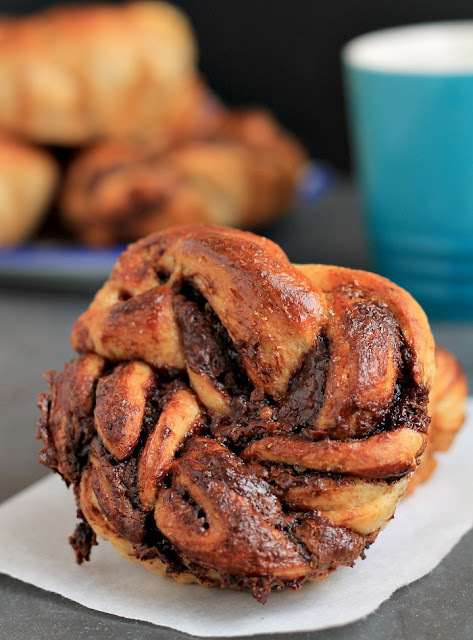 These twisted buns look so GOOD! I will start with the nutella please . Wow! I can tell you love these bread lol, looks wonderful! Each and every one of them! I want to bake some too! I have no time to make bread now because the CNY, so can you throw few for me for tomorrow breakfast, hehehe.. They sound absolutely good! Beautiful rolls, Anne! I'm very relieved that all these ingredients were not in one bread...LOL...you had me worried for a second! But I know you better than that...3 winners here! One recipe... Three variations! Very clever, Anne!!! oh wow, Ann, you need to start a bakery! Hi Anne! You are an expert at making these rolls, they are stunning! And three flavors to pick from? I can't make up my mind! Wow, such gorgeous buns! I love both sweet and savoury, though I would choose towards savoury anytime! And I have yet to meet anyone who does not like Nutella! LOL! 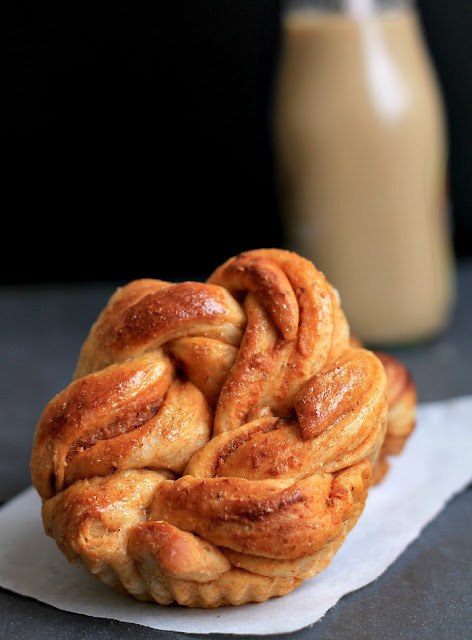 I love the shape of your buns! They are calling for a cup of hot cappuccino ! Three recipes in one post. Anne, you have out done yourself by making so gorgeous rolls. I love all the flavors. the buns are so pretty! if i were to pick, i would like to have the ricotta and tomato pesto cos i nvr had one before! !